Khyber Pass. Ghurie Lala Beg. bl.uk > Online Gallery Home	> Online exhibitions	> Asia, Pacific and Africa Collections	> Khyber Pass. Ghurie Lala Beg. 'Khyber Pass. Ghurie Lala Beg. '; and on the side of the sketch: 'Approach to Ali Masjid on the Peshawar Side'. 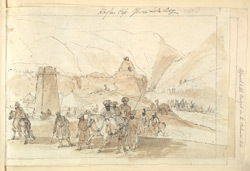 This is folio 9 from Atkinson's album of 17 drawings of views in Afghanistan from the Kyber Pass to Kabul. Atkinson served as Superintending Surgeon to the Army of the Indus, a combined force of British and Indian troops that marched on Kabul during the First Anglo-Afghan War (1839-42). He was also a talented amateur artist and completed many drawings along the route portraying the arid scenery of Afghanistan. The notorious Kyber Pass is a 33-mile long passage which cuts through the Hindu Kush Mountain Range in the North West Frontier Province (Pakistan). For centuries it has served as the only overland route through the mountains between northern Asia and the Indian plains. At its narrowest point the pass is only three metres wide. Situated at a height of 500 feet, the fortress of Ali Masjid guarded the entrance of the pass, and was therefore of key military importance during the Anglo-Afghan Wars.